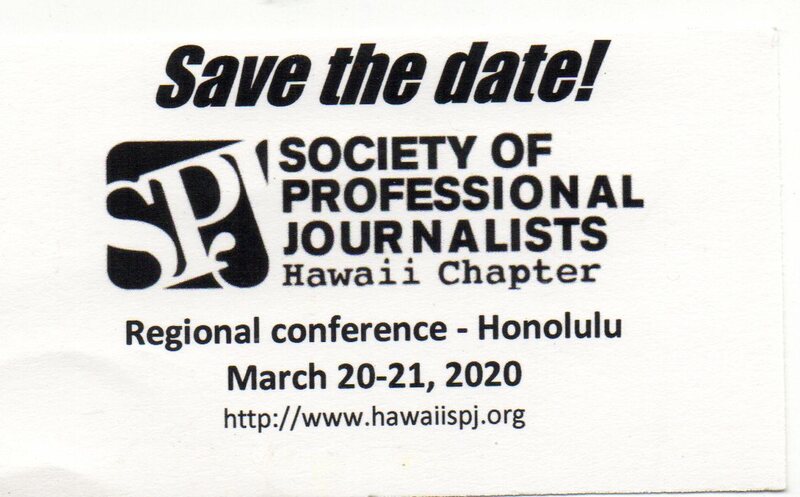 The Hawaii Professional Chapter of the Society of Professional Journalists will host the Region 11 (California, Arizona, Nevada, Hawaii and Guam) Conference on March 20-21, 2020, at the University of Hawaii Campus Center. We are working on an additional day of training for March 22. On a more depressing note, SPJ membership has dropped from about 10,000 at its prime to fewer than 6,000 now. For some reason, membership hasn't seemed a priority for SPJ national. It was suggested that journalists be polled to see what is the biggest barrier to membership. The group seemed to think the cost of membership compared to perceived benefits is a main concern. 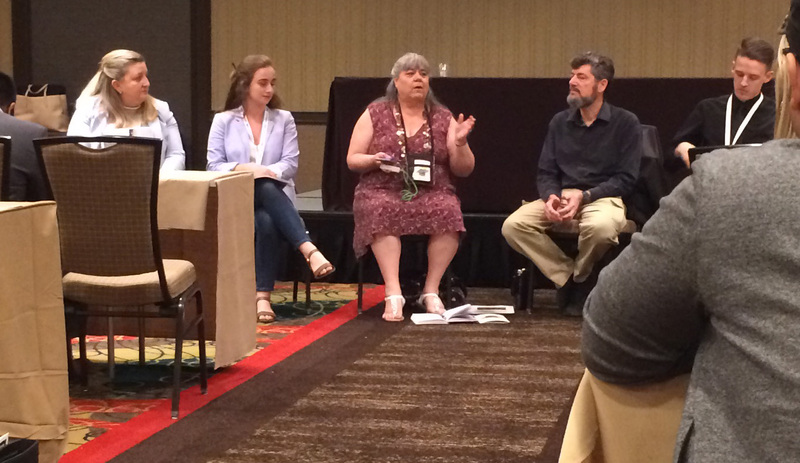 Las Vegas Review-Journal reporter Rachel Crosby, freelance photographer David Becker and KVVU TV's Christine Maddela, moderated by Nevada Public Radio senior producer Joe Schoenmann, described the trauma of covering the Oct. 1, 2017, mass shooting. Reporters on the ground during such a horrific, ever-changing event described "tunnel vision" and "reverting to your training," "running and gunning" and working on automatic pilot, but found themselves with PTSD after things calmed down. The media outlets didn't have a written plan, and quickly learned communication was the key when all hands were on deck. Maddela stressed that reporters need to report what they know, regardless of what's happening with unconfirmed reports on social media. There were some false reports that made it on air, she said. Maddela stressed compassion for victims and their families, rather than acting like some "question-seeking missile." Crosby said she still has "some" PTSD that comes and goes in waves. She also emphasized sticking with the facts: "Here's what we know right now," even if it's just which roads are closed, describing the scene. When interviewing victims and their families, be human first. Give them lots of space and let them know they're not obligated to talk to you. Becker echoed the "report what you know" mantra when captioning his photos. Someone lying on the ground bleeding may or may not be dead. While some criticized the graphic nature of his photos, some victims and victim's families, said they appreciated his work as it helped them work through their trauma. 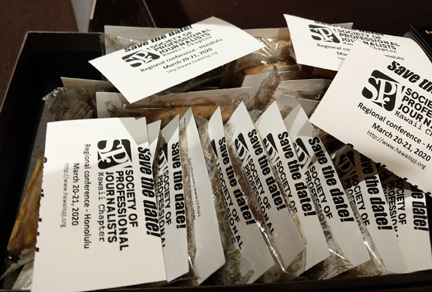 Cookies from Big Island Candies labeled with "save the date" cards helped introduce our coming conference to SPJ Region 11 conference-goers. We also talked it up with SPJ leaders, in the process securing two regional speakers to participate in sessions. And we came up with ideas for goodie bags, events, the printed program and sponsors. Scott Lewis, CEO and editor-in-chief of Voice of San Diego, and Jon Ralston, executive editor of the Nevada Independent, described how they launched nonprofit news outlets, keep them solvent and remain independent while staying competitive with legacy media. Both speakers believe nonprofit journalism is the future. Don't try to be the paper of record. Perspective, analysis and the big picture look work better than breaking news, generally. Work for the public interest. Don't compromise the truth. Be super transparent about who your donors are. Link to a list of donors on the front page. Ralston lists every donation down to $5. Don't count on just big foundations. Practice "revenue promiscuity." You can't just rely on corporate dollars. It can be awkward going to people you've covered in the past and asking them for money, but do it anyway. Push for small consistent donations ... get people committed to the cause. Set up your 501(c)(3) tax exemption early -- it takes a while to get the paperwork back. Lewis formed his nonprofit as an educational entity. 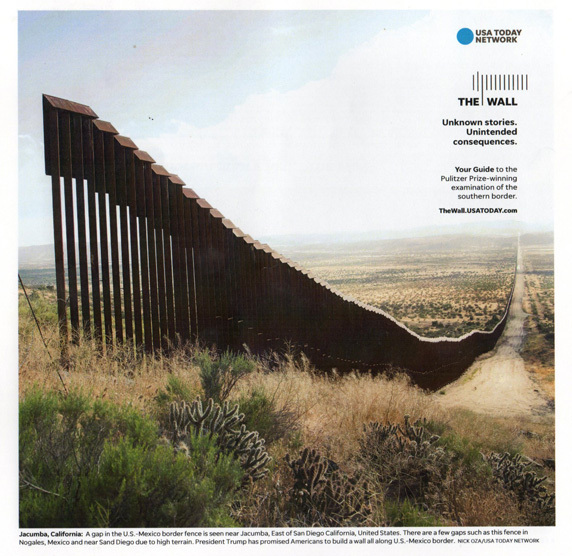 An in-depth look at the Arizona Republic's Pulitzer Prize-winning investigation into President Trump's proposal for a border wall. The newspaper was able to enlist local USA Today newspapers across the multi-state region, using local sources established over a long time and enabling them unparalleled access into border patrol, locals, migrants and even a man who made a living smuggling migrants across the border. "It wasn't our job to come up with the answer," said investigative editor Michael Squires. ""We showed the humanity on all sides of the debate." That personal, boots-on-the-ground reporting was coupled with the eye in the sky of a helicopter that followed the 2,000-mile border, collecting images that were processed into documentary films, interactive maps and virtual reality videos, podcasts and more. The entire project took nine months to complete, and then the newspaper took it on the road to film festivals and other locales to promote the project. The effect may be the perception that the media are not pursuing the public interest, a vital part of winning court cases. Such cases many times involve balancing tests oftentimes privacy or reputation versus the public interest. If the media lose the idea that they are promoting the public interest, that "could spell trouble." Recently, Supreme Court Justice Clarence Thomas wrote in an opinion about revisiting the so-called actual malice standard, a form of protection the media have in libel cases. Privacy interests are winning out in freedom of information cases. Court access is also restricted. Multidistrict cases are happening where a decision in one state affects disclosure in other states. Rachel Crosby's voice still breaks when she talks about covering the Oct. 1, 2017, shooting that killed 59 people in Las Vegas. The Las Vegas Review-Journal reporter has covered the shooting nonstop since. She acknowledged suffering from posttraumatic stress disorder and didn't realize it until long after the shooting. Her employer offered therapy dogs and counseling for reporters covering the tragedy, but said she hasn't found a counselor to help her. Sports coverage is becoming broader beyond the scoreboard, going into the legislative arenas, business rooms and betting parlors. The recent subsidy of hotel room tax revenues of $750 million to help pay for the new stadium for the soon-to-be Las Vegas Raiders was a case in point. There were many different angles in the stadium story, such as why build a massive parking lot to be used only eight times a year. A collaboration of other reporters with different expertise was needed to cover the stadium issue. Elevate Editor Beth Schwartz said that in the early days of the movement for marijuana legalization, its medicinal effects were anecdotal. Now research is being done to show that marijuana does have beneficial effects. She predicted that cannabidiol (CBD) oil will become part of everyday life. Former Nevada state Sen. Tick Segerblom predicted that federal legalization of marijuana is coming if not before 2020 elections, then shortly after. Anita Hassan, investigative reporter for the Las Vegas Review-Journal, said a reporter should make sure he or she is pretty clear what records or information is being sought. She suggested that reporters might check the agency website to see if records are listed or readily available. Wesley Juhl, ACLU of Nevada communications manager, said reporters might want to learn what information might be available by checking what forms agencies use. J.D. Morris said the Santa Rosa Press Democrat's road to a Pulitzer Prize started with an editor's direction to have "all hands on deck" to cover the October 2017 Northern California wildfires. He went about checking his sources since he covered the county government and found leads. Photographer Steve Marcus said he talks to the homeowners facing evacuation or loss of their homes to wildfires before shooting photos, much like he does when taking regular photos. It is important that the victims understand what his job is.